Uxbridge police officers Kyle Tripp (left) and William Ethier visited the baby they helped save last Thursday after it stopped breathing. A pair of Uxbridge police officers saved a baby girl who had stopped breathing last week. Officials said one of the officers managed to clear the blocked airway of the infant as family members were rushing her to the hospital. 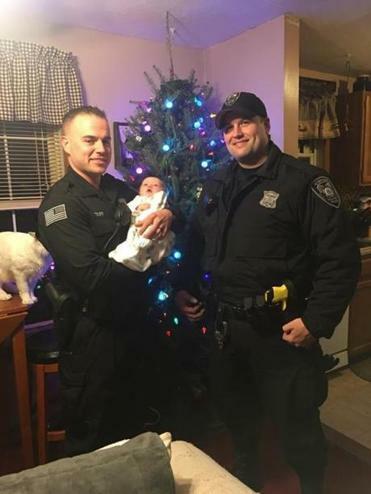 Police were first called to the family’s home in the evening of Dec. 7 after “Uxbridge Police received a 9-1-1 call that no Dispatcher or Officer ever wants to get,” reporting that an infant there was not breathing, Uxbridge police said in a Facebook post. Uxbridge fire Chief Bill Kessler said he believed the baby girl was less than 1 month old at the time of the incident. After receiving the report, police officers were sent to the baby’s home but were told on their way there that the baby’s mother and grandmother had left with the infant and were driving her to the Uxbridge Fire Department. An Uxbridge police dispatcher then got a description of the mother and grandmother’s vehicle and was able to alert the officers, and “moments later Officer Kyle Tripp intercepted the vehicle,” Uxbridge police said. Tripp then ran to the vehicle, and the grandmother handed him the infant from the car’s window. Tripp then “observed drool and what appeared to be formula coming from the [infant’s] mouth,” and he “quickly sprang into action and began performing back thrusts to remove what was preventing breathing,” Uxbridge police said. A second officer arrived at the scene soon after, and after performing several more back thrusts, Tripp was able to clear the baby’s airway and it began to breathe and cry, police said. Kessler said an ambulance had been dispatched to the baby’s home as well but was eventually able to meet the officers on the road where they had stopped after the baby’s airway had been cleared. The baby was then taken to Milford Hospital for treatment and later released. Uxbridge police Chief Jeffrey Lourie expressed his support of Tripp and Officer William Ethier, who also responded to the family’s stopped car, and said the pair will be honored by the town at an upcoming selectmen’s meeting. Tripp and Ethier also visited the recovering baby this week, he said. Kessler said that his department receives several calls for young children with “serious medical conditions” each year but credited the cooperation between the Uxbridge police and fire departments in responding to such incidents. “It’s all about helping people, it’s all about public service, and at the end of the day there’s nothing more rewarding than saving a human life,” he said. Ben Thompson can be reached at ben.thompson@globe.com. Follow him on Twitter @Globe_Thompson.